Each of our cabins offers a warm and relaxing hot tub on the deck. Get a great night's sleep in a comfortable King-sized bed. The Great Smoky Mountains fall color season lasts throughout October and into November. Our cabins give you an excellent opportunity to see wildlife! Every season in the Smokies offers beautiful views... and every view is beautiful! Views1Our Gatlinburg Cabin Rentals offer truly amazing mountain views. Sit in a rocking chair and enjoy the view. Secluded2Autumn Ridge Cabin Rentals are close to all the action but very private and secluded. Amenities3Our rustic cabins offer full kitchens, fireplaces, jacuzzi and a hot tub with an amazing view. Family4We are a family owned business that wants to help you make your vacation a success. Autumn Ridge Vacation Cabins delivers on the decades-old Pigeon Forge and Gatlinburg TN promise of a warm, cozy, and genuine Smoky Mountain cabin experience for our guests. Our cabins are all about…. well, we will let you discover that shortly…. just keep reading. Autumn Ridge Vacation Cabin Rentals is unique in the sense that is has 6 cabins situated on 7.8 acres, so that you as a visitor can experience the mountains in a tranquil private setting as the first visitors had. Our as-advertised hand crafted cabins are exactly that! Each 1950′s inspired cabin was built by family members for the purpose of preserving our Appalachian Smoky Mountain culture and to provide a legacy for their children, grandchildren, and great grandchildren to come. 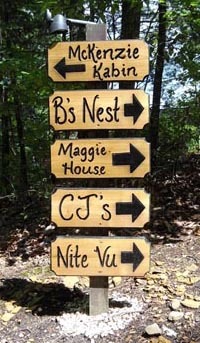 In fact, three of our cabins bear the names of grandchildren! Grandpa Bill not only made the front doors for each cabin but all of the kitchen cabinets, too! Each board was hand-picked, each joint expertly crafted, and each nail or screw strategically placed, just so you, our guest, would feel special each time you visited. In each cabin you will find a vintage photograph of our original family members, Sallie and Obie Greene, who settled here in the Great Smoky Mountains in the 1880′s. We hope you will take the time to notice their expression of joy and true love as they stare at each other, oblivious to the camera and the outside world. We are proud to say this legacy of love has certainly been passed down through the last four (so far!) generations.